Support your independent bookstore: buy it there! Over the past two months, things have been quiet in London. Jem and Tessa are preparing for their wedding, Will’s sister Cecily is at the Institute training (Will’s not terribly happy for either of these events), Gideon Lightwood is crushing on Sopie (the maid), when their peace is shattered by Gabriel Lightwood announcing that his father has arrived at the final stages of Demon Pox (gotta love that), and transformed into a giant, man-eating worm. This sets in motion a chain of events that will end with the London Shadowhunters facing down Mortmain and his Insane, Evil plan. It sounds simplistic, but in reality it’s more complex. Charlotte is facing down Counsul Josiah Wayland and his sexist ploy to oust her. In fact, one of the things that bugged me most about the book was Wayland’s character. I didn’t think, in the first two books, that Wayland was a sexist jerk, and so his attempts to oust Charlotte (going as far as trying to bribe the Lightwood brothers) felt off to me. I wanted there to be an ulterior motive. There wasn’t: he really was a sexist jerk. (He was also a 19th-century man, so there’s that.) However, he got his comeuppance in the end, which made me (unreasonably) happy. I thoroughly enjoyed this conclusion to the series. In fact, I thoroughly enjoyed the whole series. 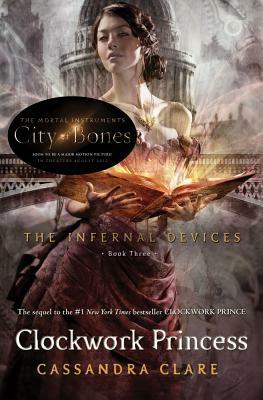 I’m not sure if I would have enjoyed it without reading The Mortal Instruments first, because much of what I liked was seeing how the two fit together (like when Magnus and Henry perfect the Portal!). But the characters were great, the storyline fantastic, and they were a lot of fun.